6/8 Kafe at Millennium Point have come up with the greatest idea ever. They are allowing the cafe space to be used as a 'permanent pop-up' for any chefs who would like it. I went along in May to try En Place's first pop-up event at 6/8. I heard about En Place via Twitter and because of the 6/8 Kafe scheme. 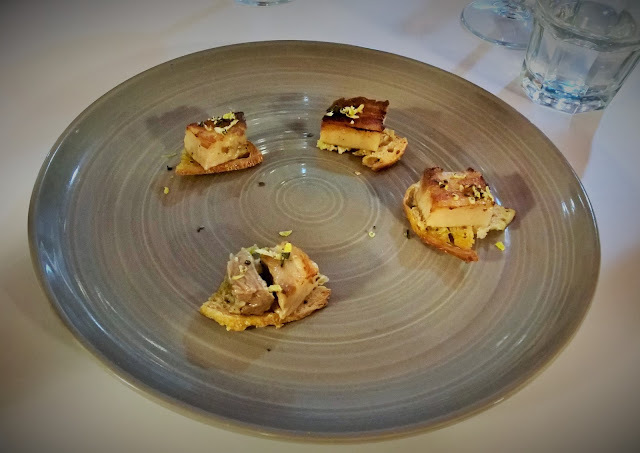 When I saw the menu and the bargain price (£35 for five courses) I knew I had to try it out. BYOB made it even better. En Place is made up of chefs Michael and Josh. 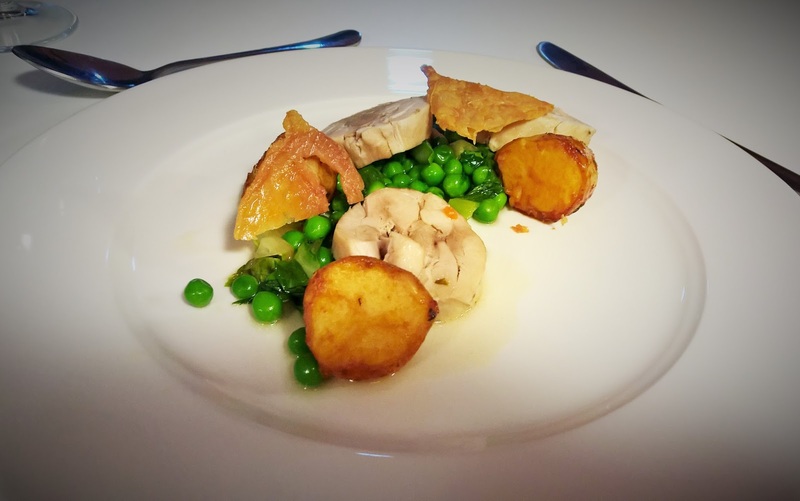 They use local and seasonal produce and their aim is to provide quality affordable food. 6/8's pop-up, BYOB and a set menu allow them to do so. I booked tickets for the Friday night, picked up some wine from M&S and headed into 6/8. It's a great space for this sort of thing- small, with a kitchen and in a quiet location. When we got in we saw Vicky from Yelp so we sat with her and her husband Dan which made for a lovely evening! We started off the meal with some little snacks. The first was delicious melt in the mouth pork belly. The second were little cheesy pastries. Both were full of flavour and got our mouths watering ready for the menu. Veal tounge, toasted sourdough, sauce gribiche. Tasty little morsels! I liked the way the texture changed depending on what you scooped onto your fork. The veal was soft and rich. 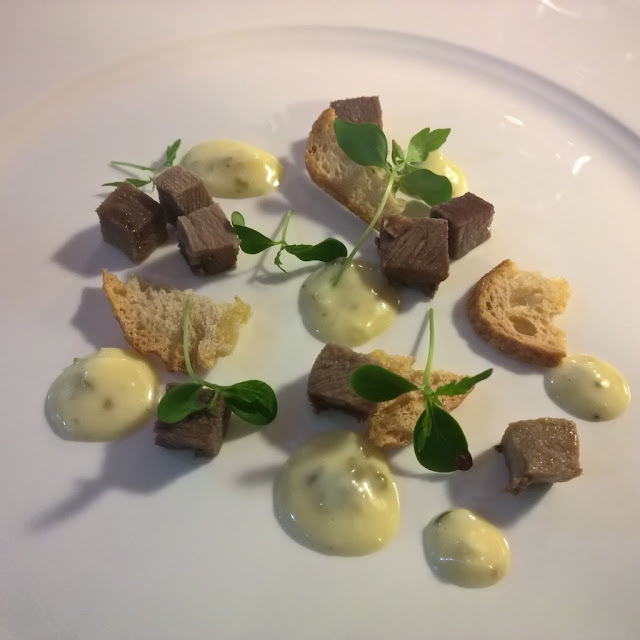 A lovely starter. Mackerel, pickled radish, samphire, tomato water. 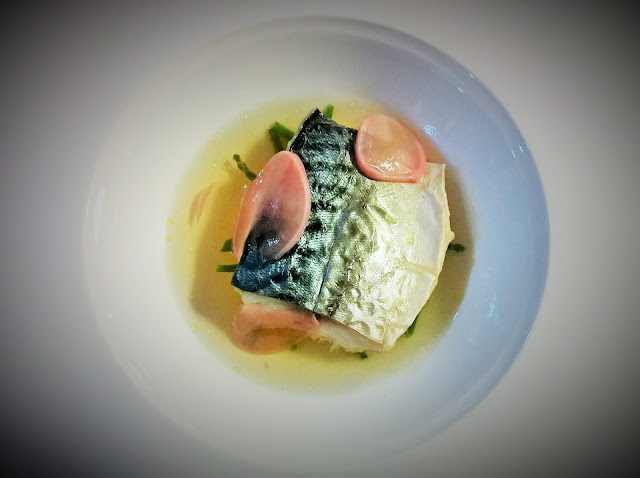 As the mackerel broke down into the water, it made a kind of fish soup which was beautifully refreshing. The tomato water and pickles were sharp and acidic and it worked perfectly. Roast chicken thigh, new potatoes glazed in marmite and thyme, peas. This was the dish that had grabbed my attention on the menu. Marmite potatoes. MARMITE POTATOES. I can tell you that the marmite potatoes were gorgeous and I am definitely going to try them myself. The chicken itself was cooked beautifully and the chicken skin was a treat. 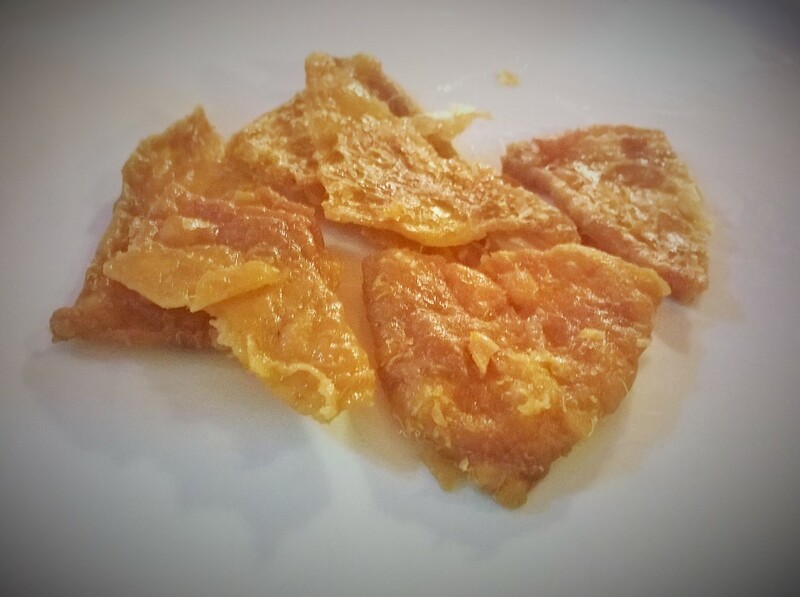 They very kindly bought some extra chicken skin as we loved it so much. 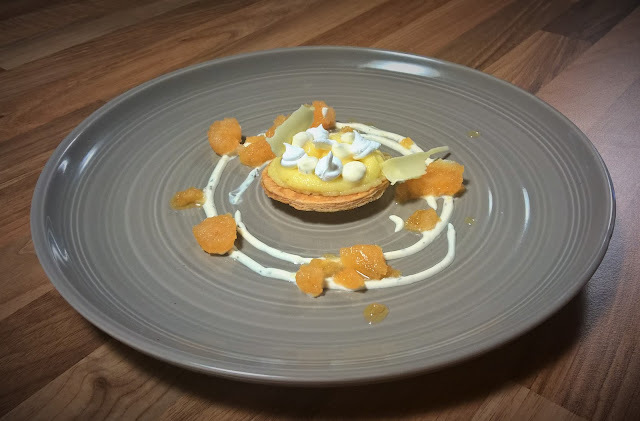 Lemon, tea, meringue. The tea element was the granita which was sharp and cold and lovely. The meringue and lemon were lovely too but I found the puff pastry a little fiddly to eat. Petit four. 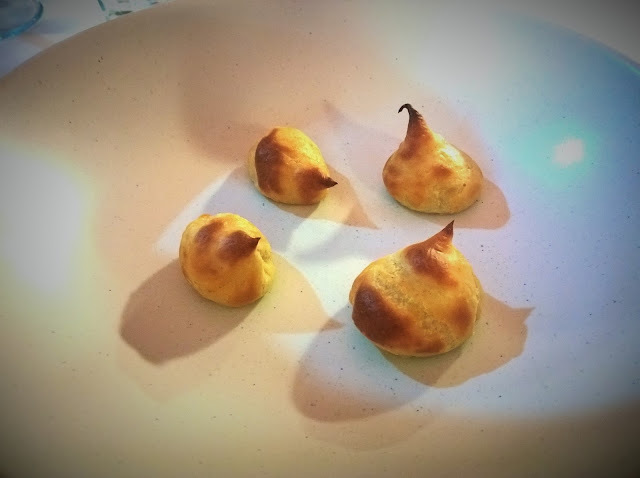 A lovely idea- En Place's take on childhood sweets. 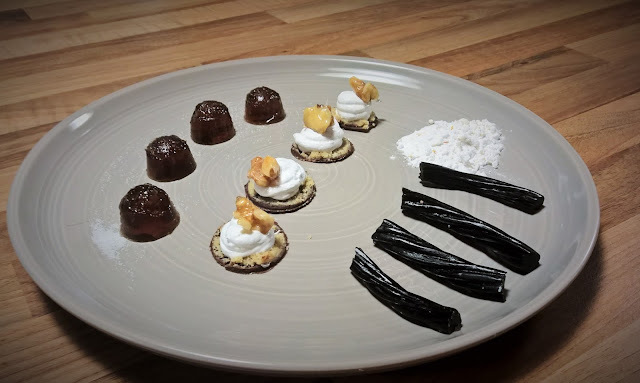 Liquorice with sherbert, mini walnut whips and cola jellies. Such a cute way to end the night.